A new virtual reality (VR) system has been launched to help architects and designers make life easier for people with dementia. The invention, dubbed the Virtual Reality Empathy Platform (VR-EP), is the brainchild of David Burgher, director at Borders-based architect Aitken Turnbull, who developed it in partnership with Glasgow computer graphics company Wireframe Immersive and experts at the HammondCare dementia charity. It replicates the vision of those living with dementia, to whom objects can appear dimmer and less colourful, and aims to reduce accidents and lessen anxiety by helping designers to introduce better contrast and signage. Burgher said: “At Aitken Turnbull we have many years of experience in designing buildings for the elderly and for people living with dementia and have gained valuable insight into the condition, allowing us to empathise with those who live with it. There are currently more than 800,000 people with dementia in the UK, a figure that is expected to rise to 1.7 million by 2051. 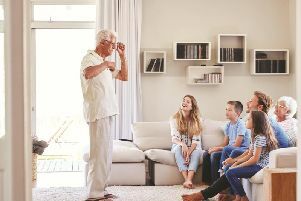 Professor Mary Marshall, senior consultant at the HammondCare Dementia Centre’s UK team, said: “One of the biggest challenges for researchers, trainers and consultants in dementia design is how you convey the experience of the environment for people living with dementia. The VR-EP system, which comprises a high-performance laptop, VR goggles, controller, camera and bespoke programming, was developed with £50,000 of funding from Scottish Enterprise and is projected to generate £500,000 in sales within three years. David McHoul, innovation specialist at Scottish Enterprise, said: “This project is another great example of Scotland’s strengths in innovation and our support will help develop this ground-breaking dementia design and empathy platform to service a patient group which is globally underserviced. Aitken Turnbull and Wireframe Immersive are currently examining the potential to export the technology to China, Europe and the US. Kevin Gordon, business development manager at Wireframe Immersive, said: “VR-EP is leading-edge technology being developed by Scottish companies and a fantastic example of how virtual reality can be used to improve quality of life.